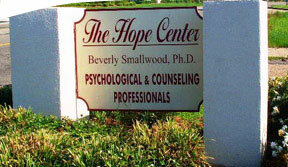 The Hope Center, founded by Dr. Bev Smallwood in 1984, has earned a reputation for providing competent and compassionate psychological, counseling, and evaluation services. Our clinical staff members are licensed and experienced professionals, motivated by a God-given calling to serve others. Our support staff help to create a warm atmosphere at The Hope Center and to meet your needs in practical ways. Visit The Hope Center on this site for details about services, staff, fees, and frequently asked questions. Feel free to call us directly at 601-264-0890 or email us for answers to your specific questions about our services.